Good morning and welcome to World Markets Live. We hope our American readers had a great 4th of July holiday! Here are the opening calls for Europe. International Energy Agency chief Fatih Birol says the global oil market should rebalance in the second half of the year under the present conditions. Speaking on the sidelines of an Energy Institute event, Birol warned, however, that further output increases from producers Libya and Nigeria could complicate things. Prices are a little lower today. The U.S. calls for international action to respond to the global threat of North Korea, as it confirms Pyongyang fired its first intercontinental ballistic missile. 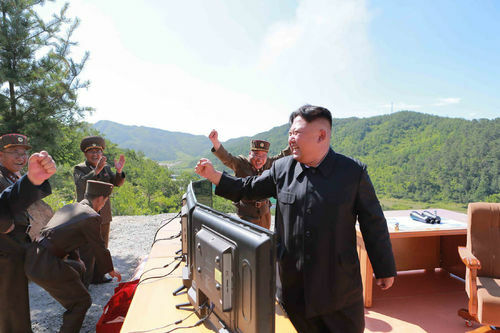 An ICBM has a range capable of hitting parts of the U.S.
North Korea claims its latest missile can carry a nuclear warhead. U.S. Secretary of State Rex Tillerson says the latest test represents a new escalation of the threat and is calling for global action. NBC's Chris Pollone filed this report on the diplomatic reaction to North Korea's latest provocation. JP Morgan has released a set of new stock ratings. Here are some of the highlights. Monte dei Paschi is discussing the bailout plan. It says the 2017-2021 plan includes the sale of 28.6 billion euros of gross and bad debts, 26.1 billion euros of which through securitization. The plan sees the sale of junior and mezzanine securities to Atlante II at a price of 21 percent of the gross value. By 2021, the bank sees a CET1 ratio of 14.7 percent and net profit above 1.2 billion euros, as well as a return on equity of 10.7 percent. Rome pumps 5.4 billion euros into Monte dei Paschi, as the EU approves the state bailout, which means Italian taxpayers are now on the hook for more than 20 billion euros to cover the latest interventions. Qatar signals its open to talks, but warns it will not accept any intervention in its domestic affairs, as Saudi Arabia and its Gulf allies get ready to meet to discuss their demands on Doha. 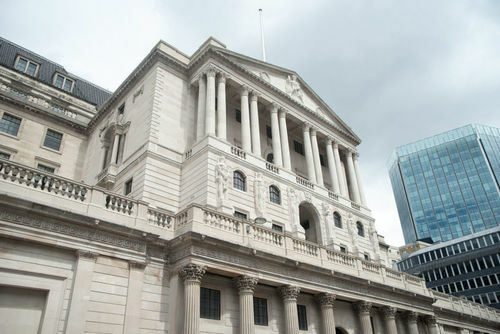 "Prepare for higher rates" - that's the message from Bank of England policymaker Michael Saunders, who says the central bank should not wait for Brexit to unfold. 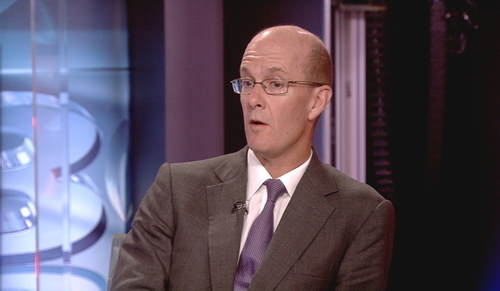 Persimmon says the group's trading performance in the first half of the year has been excellent. It says it has increased legal completion volumes by 8 percent to 7,794 new homes. Average sale price increased by 3.5 percent to around £213,000 and revenue by 12 percent to reach £1.66 billion. The house builder sees first half operating margin of more than 25.7 percent. Ocado says first half revenue came to £713.8 million, with pretax profit of £7.7 million. It says retail revenue increase 12.5 percent to £659.6 million. Profit before tax decreased by £1.7 million to £7.7 million, with net debt increased to £102.4 million due to significant capital investment in innovation and capacity. John Studzinski, vice-chairman of The Blackstone Group, discusses Ocado following its H1 results and the food retail space. In a broader sense, if you look at the announcement last week with respect to Amazon’s purchase of Whole Foods, that was a strong signal. If you look at what happened to the food retail space just at the time of that announcement it dropped precipitously. It was a strong signal that Jeff Bezos was looking at Amazon. Remember, 50 percent of retail sales are food. Therefore that is a strong signal that he is going to be strong in food. Whole Foods is very much going to be a laboratory; it’s going to drive margins down for the manufacturers as well as the retails. Moody's has changed Qatar's credit rating outlook to negative from stable, citing the growing financial risks surrounding the country's diplomatic dispute with its Arab neighbours. Moody's says the likelihood of a prolonged period of uncertainty extending into 2018 has increased. Meanwhile, the foreign ministers of Saudi Arabia, the UAE, Bahrain and Egypt are set to meet in Cairo to discuss whether to continue sanctions on Qatar. 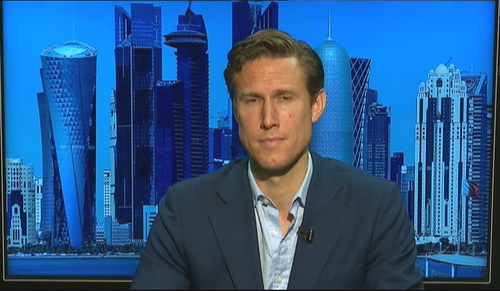 Willem Marx reports from Doha. In theory we should get a response from the Saudi led bloc at some point soon. There was a statement at the wee hours of this morning after they received the Qatari response to their initial 13-point list of demands. They said they would respond in a timely and appropriate manner. What that means of course we don’t know. Marx says Moody’s downgraded Qatar back in late May, before the crisis began in June. He says the crisis is causing concerns to credit agencies. John Studzinski, vice-chairman of The Blackstone Group, says the Qatar situation is not going to get resolved quickly. It’s not going to get resolved by public ultimatums. This is like a long-standing family feud. You’ve got a lot of issues here and when you look at major confrontations in history, there are certain themes that underline them. Common border; issues of natural resources, one is extremely strong in gas; the other in oil; different views on religion; different views on the rights of women. Remember, Qatar was a province of Saudi Arabia at one point and of course it became independent. Even within Saudi Arabia, the notion that there is a king of Saudi Arabia, the Emir of Qatar in the mind-set of the Saudis is a prince, he doesn’t have the status of a king. Studzinski says the situation will be resolved through quiet diplomacy. Swedish services PMI came in at 57.3 points in June according to SILF and Swedbank. 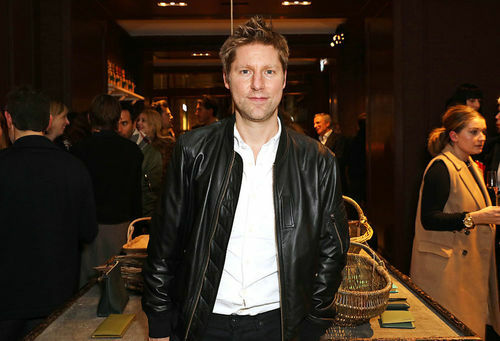 There's a new man at the helm of Burberry. 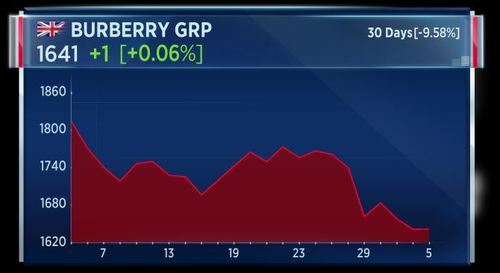 So we thought we'd take a look at how Burberry has performed under the outgoing CEO Christopher Bailey. His departure was announced in July last year following an over 20 percent drop in the stock. But since the announcement, shares have gone up more than 40 percent. His time as CEO was marked by headwinds after the devaluation of the yuan in the summer of 2015 and a string of stock downgrades earlier last year. Bailey will be replaced by the Italian businessman Marco Gobbetti who was Celine's Chief Executive since 2008. He has also ran the Italian fashion house Moschino from 1993 until 2004. Chairman of Ericsson Leif Johansson says he will not stand for re-election, according to Reuters. Ocado's CEO Tim Steiner tells investors and journalist that he sees the Amazon-Whole Foods deal as positive for Ocado. He says the firm has seen a pick-up in interest from U.S. players since Amazon acquired Whole Foods. Ocado posted its latest earnings this morning, including a pretax profit of £7.7 million. President Donald Trump is gearing up for a busy week of diplomacy. He'll travel to Poland, before visiting Germany for the G-20 summit. He celebrated his first Independence Day as president at a White House picnic for military families. He told guests "our country is doing really, really well." NBC's Kristen Welker reports. Banks and basic resources are the only sectors in the green. Defensive sectors are leading losses on the market. A mixed start for the individual European bourses. The major markets are broadly flat, while the Italian FTSE MIB is down around 0.2 percent. These are the stocks at the top and bottom of the Stoxx 600. Persimmon is topping the index. Political uncertainty arising from the U.K.'s snap general election is having little impact on the British property market. That's according to the homebuilder Persimmon, which has posted a 12 percent increase in first half revenues. The FTSE-listed company also reported a near 4 percent pickup in the average sale price for its properties over the period. 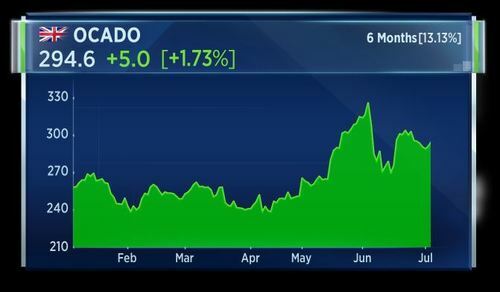 Ocado is also doing well after its earnings results. Meanwhile, Domino's Pizza received a sell rating and a price target of 250p from Liberum, leading it to the bottom of the market. Let's take a look at some stocks moving markets. First-half pre-tax profit at online grocery delivery service Ocado fell to £7.7 million, down from £8.6 million a year prior. The company cited the opening of a new distribution centre and other investments as having weighed on profits, despite revenue growth. Ocado also said it would pursue further international partnerships, after it secured its first overseas deal with an unnamed European retailer last month. Meanwhile, today is Marco Gobbetti's first day in charge at Burberry. In a shake-up announced last year, the former Celine chief takes over as CEO, while Chris Bailey is staying at the British design house, taking up the roles of president and chief creative officer. The shares are flat so far today. U.K. homebuilder Persimmon rallies to the top of the Stoxx 600, as it says political uncertainty isn't hurting revenue. It's buying time in the retail sector. 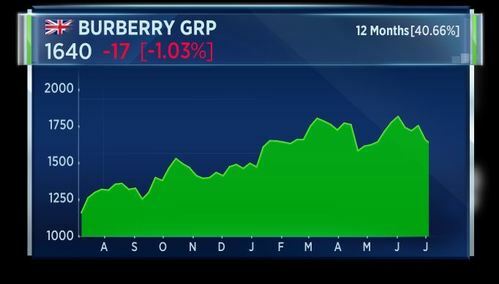 Adidas and Moncler catch a bid thanks to newly issued buy ratings, while a new CEO gets to work at Burberry. Get ready for an interest rate rise. That's the message from BOE policymaker Michael Saunders. Speaking to the Guardian newspaper, Saunders, who last month voted in favour of raising interest rates, added he was "reasonably confident" that investment and exports would compensate for a consumer slowdown. 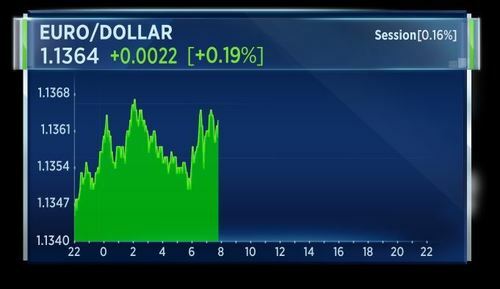 Meanwhile, the Federal Reserve could strike a more hawkish tone in the minutes from its June policy meeting, due out later today. Investors are eagerly watching to see if the central bank will signal that it is on track to move ahead with interest rate rises in the second half of the year. 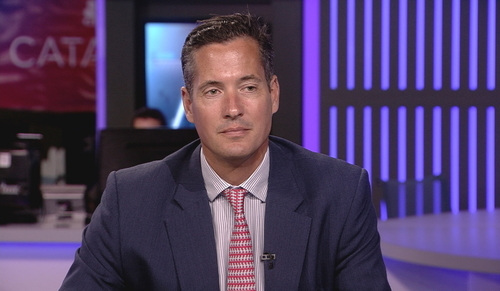 William Vereker, global co-head of corporate client solutions at UBS, explains he is concerned about the second half of 2017 due to the levels markets have reached. We’ve seen a very strong rally across the first half of the year across all asset classes and that has driven some very active deal activity, both across M&A and equity markets. As we move into the second half, I think all of us are a little bit concerned about where markets sit and are quite cautious about the outlook. Monte dei Paschi's CEO says there are no mergers planned and there is no Plan B on the table. Italian banks responded positively to the bailout plans for BMPS. UniCredit shares rose at the start of trade before paring gains, while Ubi Banca shares are up nearly 2 percent. Italian composite PMI for services and manufacturing falls to 54.5 in June from 55.2 in May. Services PMI fell to 53.6 from 55.1 in May. This was below forecasts. Russia's Gazprom may issue eurobonds in Swiss francs in July, Reuters reports citing a financial market source. French final June composite PMI falls to 56.6 from 56.9 in May. Services PMI fell to 56.9 from 57.2 in May. The euro is up against dollar this morning following decent PMI figures from France, Italy and elsewhere. We still have the German reading and the euro area PMI data to come. U.K. new car registrations are down 4.8 percent year on year in June to 243,454 units, according to the car industry body SMMT. The composite June PMI number is 56.3, higher than forecast. Monte dei Paschi unveils a drastic restructuring plan as Rome pumps more than five billion euros into the failed bank, formally taking it under state control. U.K. new car registrations is down 4.8 percent year on year. New diesel car sales are down 14.7 percent in June. Total private sales are down 7.8 percent and fleet sales are down 2.4 percent. 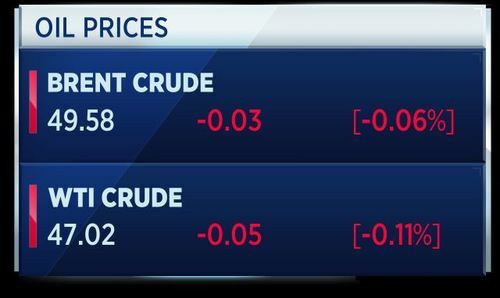 Arndt Ellinghorst, head of global automotive research at Evercore ISI Group, says these numbers are better than expected. 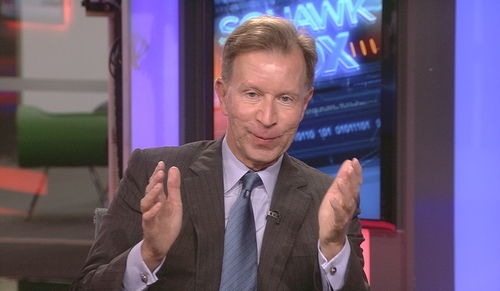 We forecast the market to be down 8 percent this year. As you mentioned, consumer uncertainty is pretty high, consumer confidence is down, so naturally you would expect car sales to fall, but car makers are offering huge discounts so that’s driving people into showroom rights now, but that drop of 4.8 is better than we expected. Adidas shares have gotten a lift after HSBC raised its stock rating to buy from hold. In other retail re-ratings, Zalando has been dropped from Goldman Sachs' pan-Europe buy list. And Jefferies has initiated coverage of Moncler and Yoox Net-a-Porter, giving both buy ratings. International Energy Agency chief Fatih Birol says the global oil market should rebalance in the second half of the year under the present conditions. Speaking on the sidelines of an Energy Institute event, Birol warned, however, that further output increases from producers Libya and Nigeria could complicate things. 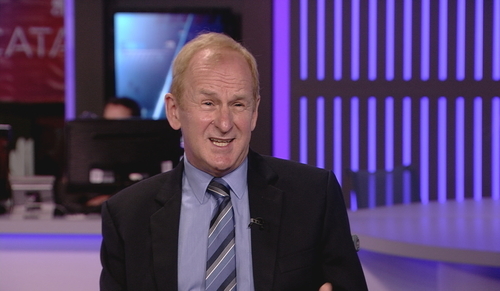 John Abbott, global downstream director at Shell, discussed coping with low oil prices. Shell looks at a range of oil prices and quite often we talk about lower for longer. Really the longest term strategy is the thing that is really important for Shell. 2016 was a year for Shell which was a complete reset with the BG integration and we saw oil prices come down after that. So we said, look, we need to set up a world-class investment case for Shell. What does it look like for the next 5, 10, 15 years? We set very clear free cash flow targets and return targets. Abbott says the company has achieved good free cash flow performance this year. We'll be live from the World Petroleum Congress next week, speaking to the top oil company chiefs, and leading OPEC and non-OPEC energy ministers. Tencent shares have just started recovering slightly, after falling more than 4 percent in yesterday's session. This after the Chinese tech giant said it was limiting the play time for younger gamers for one of its most popular games: "Honour of Kings". 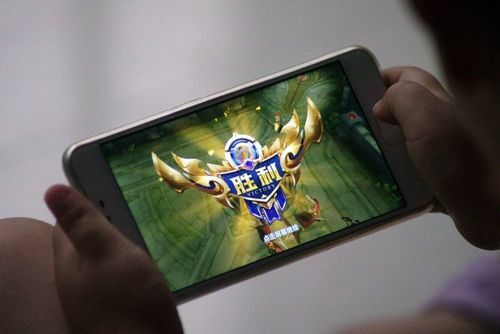 A child plays online game "Honor of Kings"
The move is aimed at curbing addiction among children, something the company and its peers have come under pressure for. "Honour of Kings" has over 50 million daily active users and is Tencent's top grossing game. 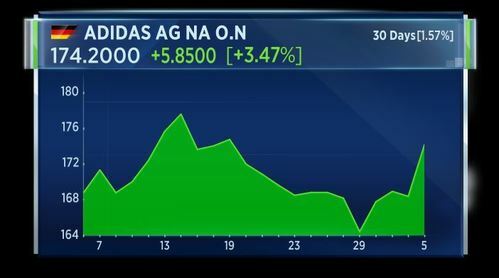 Earlier today, Deutsche bank raised its price target for Tencent by 7.4 percent to HK$320 and rated the stock a buy. Euro zone May retail sales rise 0.4 percent month on month and 2.6 percent year on year. April retail sales were revised to 2.6 percent from 2.5 percent previously. Norway June seasonally adjusted housing prices fell 0.7 percent versus May. Housing prices are up 6.3 percent year on year. The Kremlin says President Putin will use his meeting with Trump to explain Russia's stance on Syria and Ukraine, Reuters reports. The meeting, which will take place during the G20 summit, will be limited in time. The meeting is to explore whether there is a possibility and readiness for Russia and U.S. to fight terrorism together. Moscow hopes the meeting will establish an effective working dialogue between the two leaders, which is needed to resolve mounting conflicts around the world. 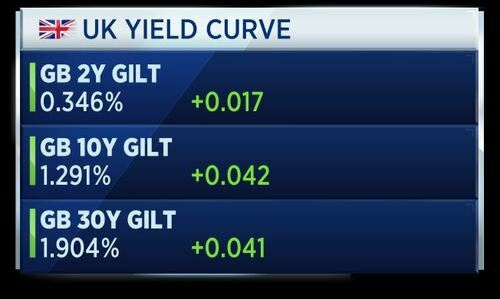 U.K. 30-year gilt yields hit 1.911 percent earlier in the session, this is its highest level since February. The yield is up 4 basis points currently. 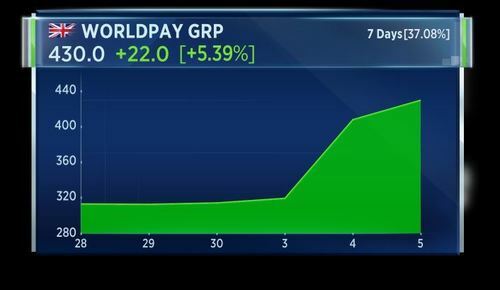 Worldpay shares are up more than 5 percent today, following on from yesterday's strong gains. The payment processing company announced yesterday it had been approached by two separate companies bidding to take it over. Today's share price spike is apparently due to a Sky report that the company's board is backing an £8.5 billion deal with Vantiv, according to Reuters citing traders. Lloyds Bank has announced a series of organisational changes in anticipation of a new strategic plan. Here are some of the appointments. Juan Colombas, the executive director, is appointed to a new role as chief operating officer. George Culmber, chief financial office and executive director, will take over the legal and strategy teams. Zaka Mian is appointed group director of transformation. Vim Maru is appoint to group director of retail. Rreserve bank of Australia board member Ian Harper says now is not the time to "scare the horses" with hawkish guidance, Reuters reports. This after the central bank yesterday voted to keep rates on hold. Harper says is it a case of "steady as she goes" on policy and there is no reason to rush policy changes, or follow other central banks' hawkishness. 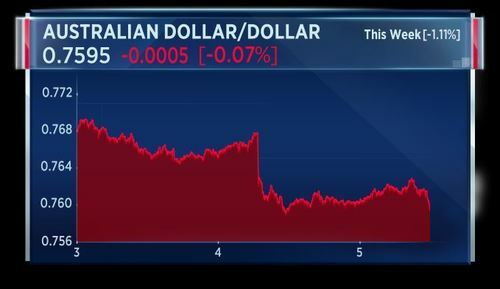 Harper says Australia's recover is on track, but the job market slack is notable and a lower Australian dollar would be welcome. He says it is not clear if inflation is rising. 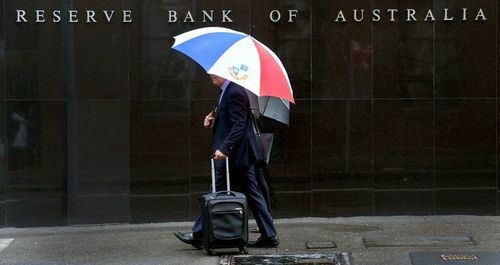 The Australian dollar dropped sharply against its U.S. counterpart yesterday on the central bank decision. It is down more than 1 percent against the U.S. currency so far this week. President Trump will be visiting Germany for the meeting of world leaders at the G20 summit later this week. But first, he will be visiting Poland. He is visiting the Eastern European country at the invitation of President Andrzej Duda, to "reaffirm the U.S.' steadfast commitment to one of its closest European allies and emphasize the administration's priority of strengthening NATO's collective defense." Presidents Trump and Duda discuss bilateral and regional issues, while President Trump also delivers a 'major speech' and attends the Three Seas Initiative summit. The president takes off in Air Force 1 at 07:40 a.m. EDT and will in Warsaw around 4:15 p.m. EDT. 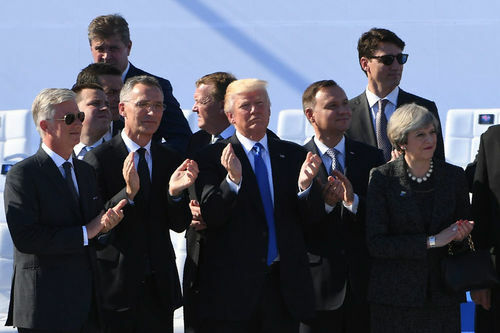 Polish President Andrzej Duda stands to the right of President Trump during the May NATO meeting.